Stunning redevelopment of the Palacio Bencich creates new home for Korean culture in BA. The South Korean Cultural Centre in Buenos Aires has inaugurated its new home, at Retiro’s stunning Palacio Bencich. The 2,000-square-metre space is the latest initiative by the Asian nation to expand its cultural presence in Argentina, while also strengthening bilateral ties in the region. From this month, the Palacio Bencich – situated on Maipú street – will host a permanent collection of objects from South Korea, as well as a special area for temporary exhibits, a library, an open-air amphitheatre, and a conference, functions and film screening room. “We have made an enormous effort and economic investment to restore the Palace without overlooking the need to protect its cultural and architectural heritage,” the centre’s director Sang Jinsang told visitors during an event marking its inauguration. Palacio Bencich was constructed in 1914 by architects Eduardo M. Lanús and Pablo Hary. The design found inspiration in the hôtels particuliers of Paris. It was first used as a private residence before being acquired by the Republic of Korea. “We learned the building was in a serious state of deterioration. A long time had passed since it had received maintenance works,” said lead restoration architect Sebastián Abu Hayatian, associate of the Baek y Asociados firm, referencing the redevelopment process. The process of restoring the building involved compliance with conditions put in place by Buenos Aires City Hall’s Office of Urban Interpretation. The basic structure of the building was not modified in any way, officials stressed. “The entire rooftop terrace, facade, rear facade, patios and stained-glass windows were restored according to current norms and with a rigorous respect for construction techniques used at the time of its original development,” Abu Hayatian said. 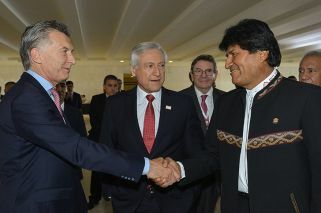 In attendance at the inauguration were the national Culture Secretary Pablo Avelluto and Buenos Aires City Culture Minister Enrique Avogardo, among other politicians and cultural leaders. For his part, Avogardo highlighted the multicultural qualities of a city like Buenos Aires as the chosen host of a unique cultural centre in the region. “Buenos Aires is a cosmopolitan and historic city which was built on the foundations of immigration, which like cities in other parts of the country remains an open city,” he said. “In my mind, it is an honour that the Korean government has invested this way, not only in its own culture but in ours, by restoring this marvellous palace. 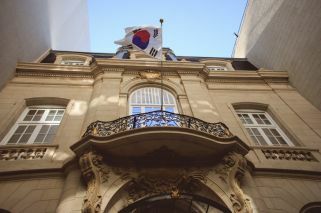 It is also very interesting to see how they have established a crossover, because [Palacio Bencich] is a clearly French building but it will host Korean culture,” Avogardo added. “We had already been working with the Korean Cultural Centre but now more than ever we have an opportunity to bring our countries and cultures together,” he said. During a tour of the building, visitors were introduced to the many spaces that compose the new centre, which include furniture, designs and decorations from South Korea. Ancient and modern expressions come together in the first of the centre’s spaces. On one wall, a projector shows the latest trends in K-Pop, a musical genre that emerged from South Korea which continues captivating people worldwide, especially teenage and adolescent fans. On the opposite wall, visitors can find a homage to the Hangul writing system, created in 1443 on the orders of King Sejong to unify the kingdom under one language. In another part of the building, the hanok display showcases traditional Korean homes and living spaces which, during their time, drew on elements of nature to remain practically unmodified for six centuries. A separate exhibition about hanbok explores Korean traditional clothing, with a collection of garments that underscore the diversity of colours and purposes in Korean dress wear. Visitors can also learn about traditional Korean cuisine. Located on the first floor of the palace, the Kim Yun Shin room bears the name of a Korean artist who migrated to Argentina in 1984 and who in 2008 opened a museum in the Flores neighbourhood. The room was inaugurated by the artist with her own works. On the bottom floor, the Time Travel exhibit organised by the Korea Craft & Design Foundation (KCDF) brings together artisanal utensils and designs. These were previously shown in Spain and South Korea. Artists include Ko Heesook, Kim Deokho, Song Youngdo, Yun Jongsook, Yang Byeongyong, Lee Joonghan, Charlotte Therre, Lee Inhwa, Ahn Yihwan, Heo Daechun, Oh Wangtaek, Shin Healim, Yun Gyusang, Bae Sejin, Han Kyunghee and Min Bogki. The South Korean Cultural Centre is located on Maipú 974. For more information about the Centre and its activities including free activities like concerts, film screenings and panel discussions, visit argentina.korean-culture.org/es/welcome.